GIFT CLOSET: A magical place where you will always find the perfect gift just when you need it even if you waited until 10 minutes before the party to start looking! How Cool! I even included a personal message! YOU CAN WRITE ON...WITH CHALK! WOOOO HOOO! 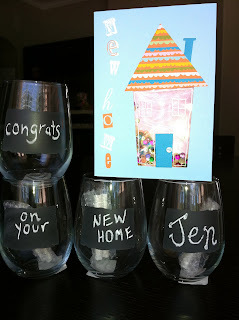 I love these glasses, they are beautiful and cheap (only $3/each at Pier 1, chalk is included - SAY WHAT?! ), plus, who doesn't LOVE wine? FUN! 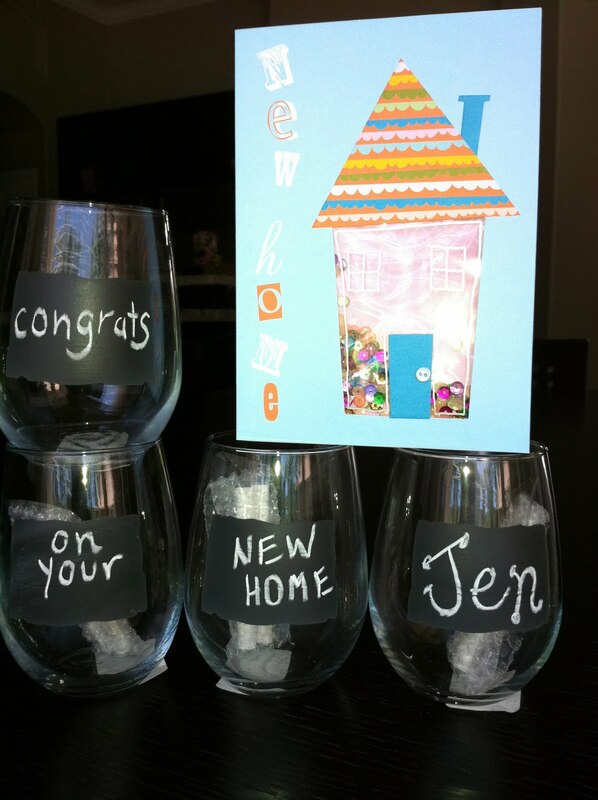 Plus, add a nice, decently priced cheap bottle of vino and voila, WHAT A THOUGHTFUL HOSTESS GIFT. And who knows, maybe the recipient will even be nice enough have enough class to pop the bottle right there and share the gift. It's perfect...the gift that keeps on giving! And that's why this is one of my FAVORITE THINGS! By the way, this particular basket is going to one of my oldest she really is older than me...by one month and one day and dearest friends Jen who is moving into her new home as we speak and as I write this blog, when I should really be helping her move. Whoops! Hopefully she'll forgive me or at the very least we'll have a good laugh about it over a nice glass of vino provided by yours truly. CHEERS!!! Any fun & super easy gift ideas you'd like to share? C'mon, you know you want to! The first one to FOLLOW this awesome blog and leave a comment below will win something out of my incredible gift closet shelf...storage bin. I'll even pay for the postage & shipping or hang it in a plastic grocery bag from my front door and you can swing by and pick it up at your earliest convenience. GO!